In 2013, after a competitive bidding process involving more than 20 international firms, WRB was chosen by the Office of Utilities Regulations in Jamaica to develop the utility-scale Content Solar project ─the first of its kind in the Caribbean. In June 2015, WRB Enterprises signed a $62 million financing agreement with the Overseas Private Investment Corporation (OPIC) and the U.S. Government’s Development Finance Institution for the development of the 20-megawatt, grid-connected solar photovoltaic facility in Clarendon, Jamaica. Project construction commenced in July 2015. The project is scheduled to be operational in June 2016. 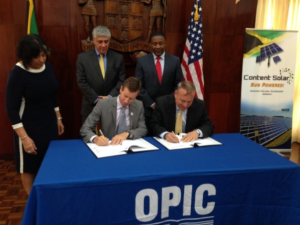 June 25, 2015–WRB Enterprises Chairman and CEO, G. Robert Blanchard, Jr., signed the financing agreement alongside OPIC Chief of Staff John Morton, with Jamaican Minister of Energy Phillip Paulwell and U.S. Ambassador to Jamaica Luis G. Moreno officiating the ceremony. 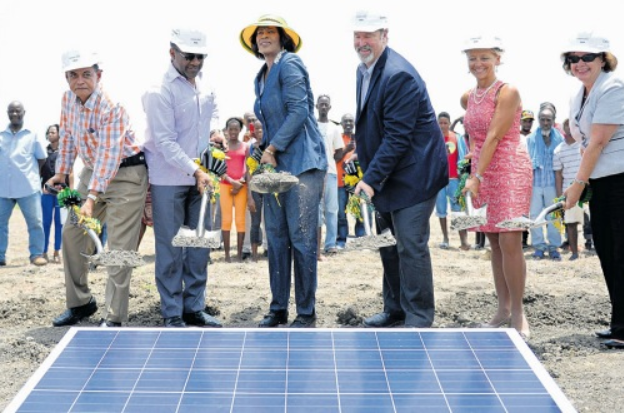 July 11, 2015– Jamaican Prime Minister Simpson Miller (third left) breaks ground for the development of the first utility-scale solar energy power plant in Jamaica. Joining the Prime Minister are (from left) Member of Parliament and Minister of Local Government and Community Development Noel Arscott; Minister of Science Technology, Energy and Mining Phillip Paulwell, President and CEO WRB Energy and Content Solar Ltd, Robert Blenker; President and CEO Jamaica Public Service Kelly Tomlin; and Chargé d’ affaires at the US Embassy Elizabeth Martinez. 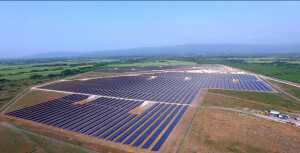 Aerial view of 154-acre Content Solar PV power plant in Clarendon, the first utility-scale solar PV plant in Jamaica. On August 28, 2016, Content Solar Ltd. launched commercial operations of Jamaica’s first utility-scale solar PV plant. 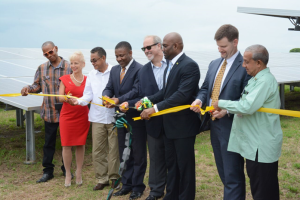 Content Solar, a 20 MW grid-connected solar plant, will power more than 20,000 households over the next 20 years under a power purchase agreement (PPA) with Jamaica Public Service Company (JPS).